12 weeks. 10 teams. The sixth Boomtown accelerator class finished with Demo Day on Friday, August 12. It was an intense day for all of the startups involved. The day culminated in a sold-out Boulder Theater and the attendees had nothing but love for the teams. Myonic, Emrys, BeVisible, Lifestyle Connect, InnaMed, adJelly, cliexa, DMI, Mimi and WageKick spent the first part of their day with potential investors. The founders of each company pitched their ideas and accredited investors, vying for the opportunity to hear more and participate with these promising ventures, meticulously questioned them. Friday evening the teams presented to the public. “Involving the Boulder community, investors and other entrepreneurs is a fundamental piece of what we do,” continued Lathrop. 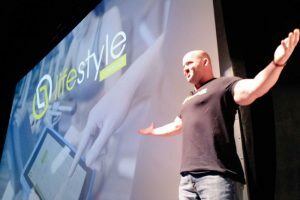 “People are pretty busy on Fridays in the summer, but we sold out with 1,000 people in the audience.” Lifestyle Connect kicked off the night and Myonic finished it with a standing ovation. Here at Boomtown, it is not just about getting through Demo Day, it is about the process and the learning that goes on to get there. Just like the startups who take part in our program, we are constantly innovating. We update curriculum, change the timeline during the three-month program and improve mentorships. No cohort experience is ever quite the same. We also experimented on this cohort to see what worked and what didn’t. One experiment this year looked at the timing of bringing in certain concepts, like financial modeling. Other small experiments included how we facilitated mentor introductions; we cut the process down and got more mentors involved. “It wasn’t just about timing and efficiency, it was about how it felt to our teams and mentor community,” Stadler said. By listening to the previous group of mentors, we implemented these changes in time for the summer cohort. Boomtown innovations are underway for the fall cohort starting in September. “I’m pairing with a few amazing groups of mentors to get them hands-on with program outcomes in their area of expertise,” Stadler said. Right now our leadership is combing through applications. With three programs each year, Boomtown gets about 1,000 applications. Only 30 startups are chosen all year, which puts us at a 2-3 percent acceptance rate. “We look for startups that may have less traction but have the raw ingredients for success,” Toby Krout, executive director of Boomtown said. Over the next few weeks, we will choose the right startups with the right ideas and who are the right fit for us. We look forward to helping our entrepreneurs grow during the program and then let them #GoFromHere.